There is nothing quite like a steaming bowl of soup to make you feel better when a cold is getting you down. As a brand ambassador for Sterimar, I'm big on natural cold remedies ; Chicken Soup may be a cliché when it comes to natural cold remedies but trust me, it works! 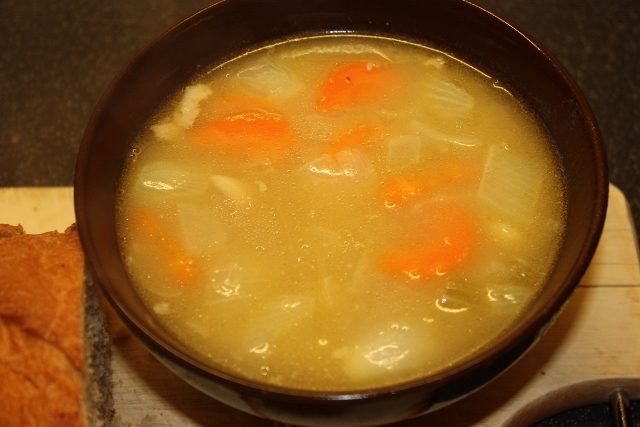 The warmth of a bowl of soup helps to raise your body temperature and the calories are just what your body needs when trying to fight off a virus – soup is easy to make and even easier to eat when you your body feels tired and unwell. 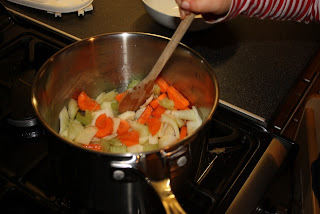 This recipe for Chicken Soup is one that I recently cooked with my 3 year old girl (we sort of made it up as we went along). I have filled the freezer up with single-portion servings of the soup so that if (or should that be when) one of us comes down with a cold we can just defrost a portion and eat it to help perk us up on a wintery day. To make it you will need a whole chicken carcass – my advice would be to have a nice family roast chicken dinner with all the trimmings and then save the carcass for use the next day to make a batch of this warming soup. Making the soup well in advance and then freezing it in single portions means that it will be ready and waiting for you when you most need it. Pick all of the remaining meat pieces from the carcass and break into shreds – you will need this meat later so put it in the fridge. To make the stock, break the carcass and place it, the skin, bones and any gravy you might have left over from your roast dinner into a big saucepan and top up with the cold water until it covers the bones. Cut one of the onions in half and place in the saucepan. There is no need to peel the onion, just make sure that the skin is clean and plonk the whole thing in. Cut one of the celery sticks in half and place in the saucepan. 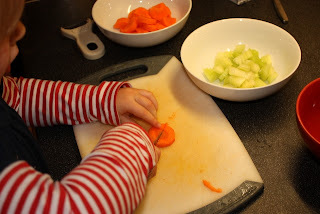 Cut one of the carrots into 1-inch chunks and place in the saucepan. There is no need to peel the carrot, just make sure that the skin is clean before you cut it into chunks. Place the two bay leaves in the saucepan and then bring the contents to the boil. Cover and simmer for about 2 hours until the volume of water has halved. If the water level goes down too far before the two hours has passed, top it up with some boiling water from a kettle and turn the heat down a little bit. 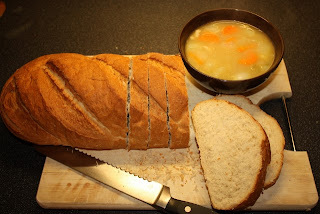 Once the stock is made, turn the heat off and allow it to cool for at least half an hour. Then place a sieve above a large bowl or another large saucepan and strain the stock through the sieve. You can leave the bones and vegetables in the seive to drip so that you get every last drop of chicken stock in your bowl. Allow the stock to cool and then place it in the fridge to cool further. To make the soup you will need 2 pints of the stock. Skim the fat from the top of the stock before you use it. Roughly chop the other onion, the other carrot and the other celery stick. Heat the butter in a large saucepan over a medium heat until melted. Add the carrot, onion and celery and fry gently until very lightly browned and softened. Then add the reserved chicken shreds and fry for a further 2 minutes. Now add the plain flour and fry for another 2 minutes. Add some ground black pepper and then 2 pints of your home-made chicken stock. Bring to the boil and then simmer for about 10-15 minutes until all of the vegetables are soft. Pour the soup into single-serving plastic containers with lids and allow to cool fully before freezing. The soup will keep for 2 or 3 months in the freezer if the containers are well sealed. To reheat the soup, defrost fully (either overnight in the fridge or in the microwave) and then heat until piping hot all the way through.